It’s that time of year again and your vote is needed to determine who will best represent the interests of our community. 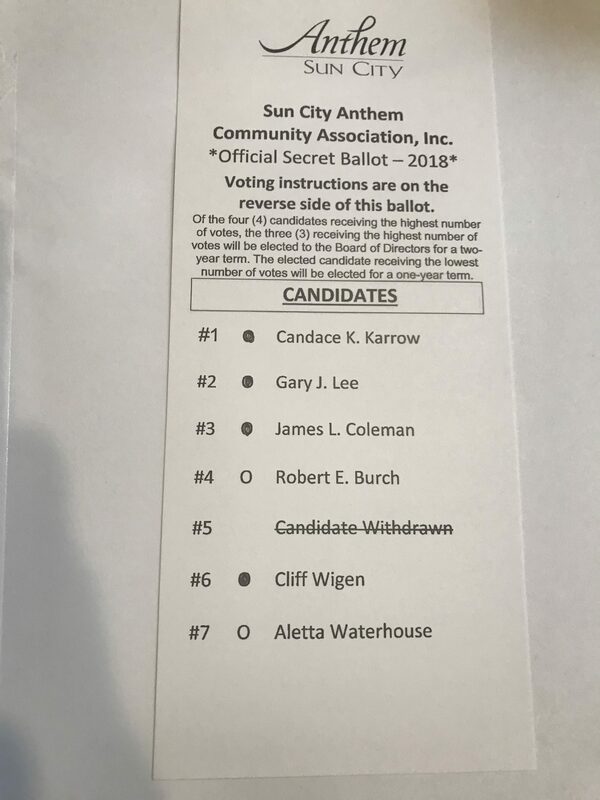 On the heels of the results of a very divisive recall petition, where a substantial number of members voted to throw Bob Burch and Aletta Waterhouse off of the board, your vote is more important than ever. While that petition failed to meet the very high threshold needed for a director’s removal from the board, this election campaign has provided voters with another opportunity to demonstrate their concern. It’s my position that the community would be far better served by electing three new members to the board rather than returning any of the old directors who had been previously elected. 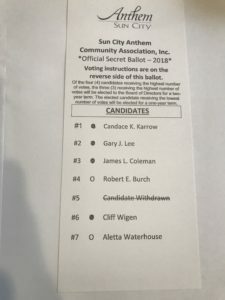 Let’s say goodbye to Bob Burch and Aleta Waterhouse and vote for JAMES COLEMAN, CANDACE KARROW, GARY LEE AND CLIFF WIGEN. Director James Coleman was not elected but was appointed to the board last year. My concerns about Burch and Waterhouse stem from the board’s questionable and potentially illegal actions in approving if not directing management to adopt certain accounting gimmicks. Those accounting gimmicks have resulted in the deferral of almost a million dollars annually in scheduled repairs to the following year(s). 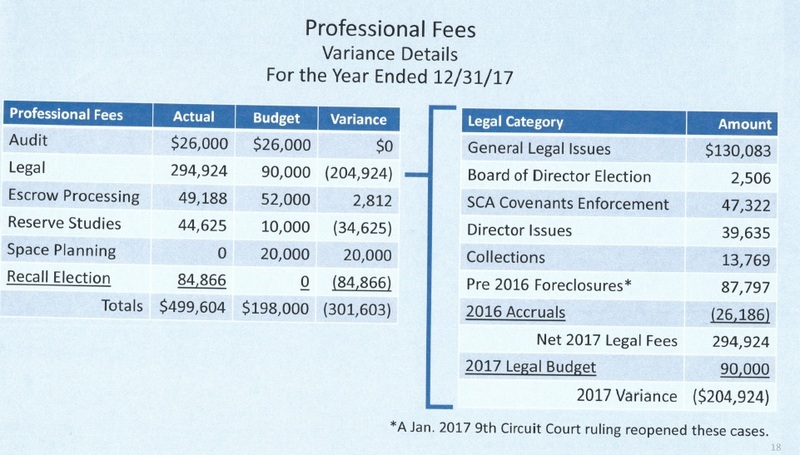 Such unreported deferrals amount to self-serving efforts by the board to avoid increasing assessments, thereby helping those directors who are running for reelection. While one prominent blogger has been eager to pass along management’s assessment that the Association’s finances are in “excellent” shape, that assessment is grossly misleading. That assessment failed to reflect what’s been really going on behind the scenes in what I view as an unorthodox effort to provide millions of dollars over time for unanticipated and unfunded repair projects at Liberty and Anthem Centers. One method management adopted was to defer almost a million dollars in previously scheduled repairs from one year to the next year. Such deferrals have a cumulative effect on subsequent scheduled repairs in the following years, which is exacerbated when there are recurring unplanned events in the following years, like the Anthem Locker Rooms, forcing management to annually push scheduled repairs forward year after year. As reserve funds are expended for such unplanned repairs, the reserve fund keeps going down by that amount. At some unknown future date, that reserve deficit will have to be replenished. Meanwhile, the board will continue to rely on members not paying close attention to what’s going on behind the scenes in the accounting room as your money get “created” and spent for unbudgeted purposes. Did the board or management influence G2G (Denny’s) to drop gaming in order to assure their likely selection as a tenant? Some residents are looking forward to the possible creation of the NEW YORK CLUB. How to make your vote REALLY count! No matter how disenfranchised you feel. This envelope will be in your mailbox today or Monday. 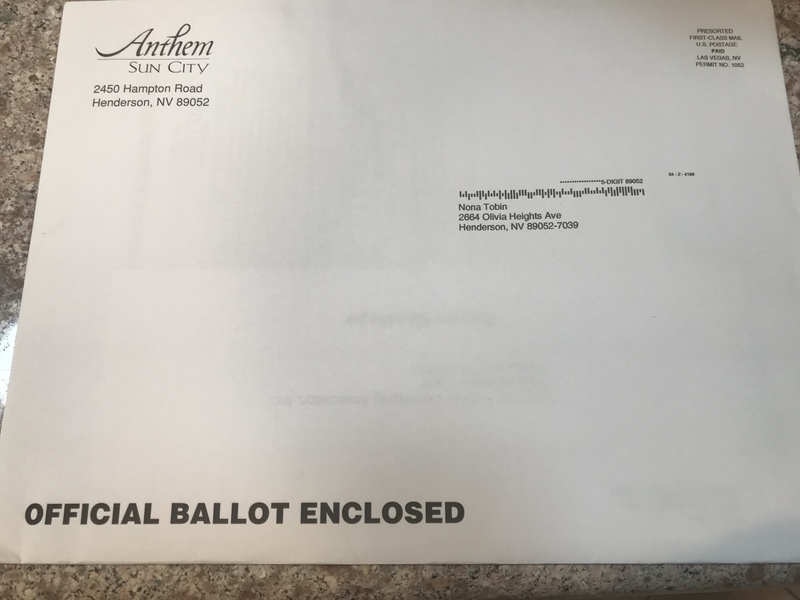 No problem recognizing your ballot this time. Do you want to drain the swamp? Ironic signs have been posted. Happy Easter! Time for renewal and rebirth! Author nonatobinPosted on March 31, 2018 April 27, 2018 Categories 2018 SCA BOD election, Attorney fees, Ethics, Take Action, Uncategorized, Unfair BOD actions3 Comments on How to make your vote REALLY count! Mr. Fox, Esq., has been hired to watch the chickens. The family dog has been left alone with the owners’ cake. The problems with the implementation of self-management will continue unless the system is changed. Changing Board members won’t make the difference. The system has to be changed to include owner oversight, checks and balances, and guarantees that owner protections are firmly in place. Tom Nissen frequently describes the implementation of self-management as “setting up a whole new company”. In my view, that misunderstanding of SCA as an entity is a crucial part of the problem. 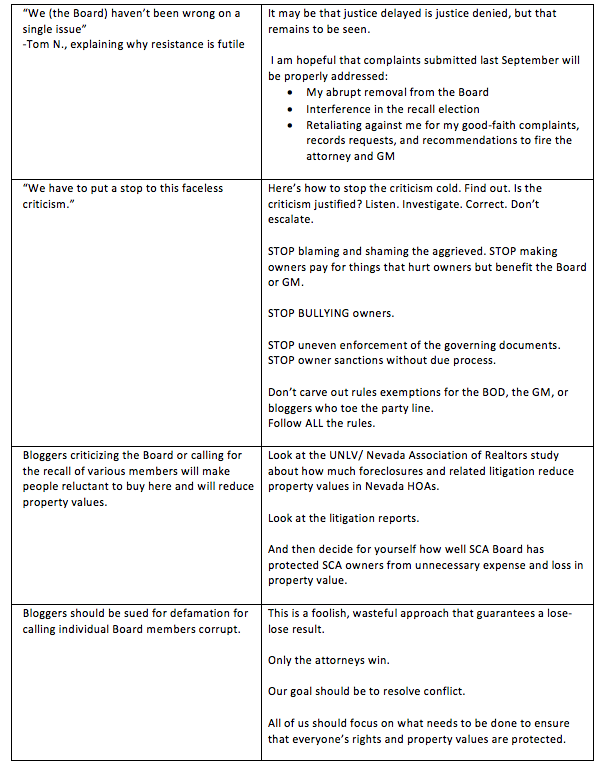 The things that are missing or are being done wrong (anything which is not done 100% for the benefit of the SCA homeowners is WRONG) are being done because the Board members erroneously think SCA should be set up like a company. SCA is not a company. It is a non-profit corporation incorporated under NRS chapter 82. It is now an employer by virtue of becoming “self-managed”. It is a mutual-benefit corporation that exists solely for the benefit of the owners. It is fully funded by the owners. It is a monopoly and membership is a requirement of ownership. Owners who own specified parcels of land (listed in SCA’s CC&Rs) must be in SCA. No owner can withdraw or pick a different competitor HOA. Every lot has the responsibility of paying an equal share of the cost of maintaining the common elements. When a lot is purchased, it carries with it deed restrictions which cannot be escaped. In exchange for agreeing to relinquish certain individual freedoms of choice as to how owners can use their lots and the common areas, the CC&Rs and state law guarantee certain protections for owners and prospective purchasers to prevent their being sanctioned unfairly, lied to, or treated differently from other owners. It is the Board’s job to make sure ALL owners comply with the deed restrictions and that ALL owners are protected from unfair enforcement actions. 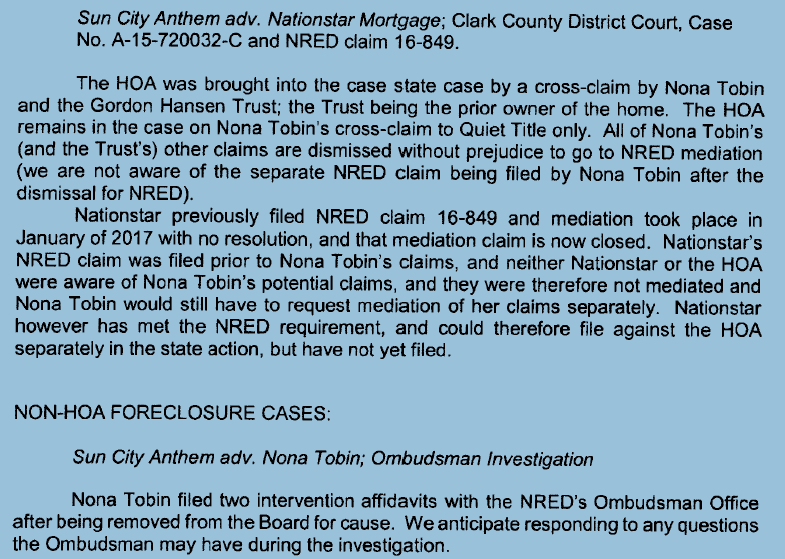 when it usurps the enforcement authority of the Nevada Commission for Common-Interest Communities by sanctioning a unit owner for an alleged violation of NRS 116. What is the Board’s enforcement job? It is the Board’s responsibility to ensure that ALL owners comply with the deed restrictions as listed in SCA governing documents, i.e., CC&Rs, bylaws, and any rules and regulations formally adopted by the Board. The Board can only perform this enforcement function if it does so by giving an accused owner the due process protections guaranteed by law, i.e., notice, a hearing, a chance to correct, etc. Here are the governing provisions of the law and SCA governing documents that are intended to ensure that the Board protects owners and does not ever allow an owner to be sanctioned without these guaranteed protections having been provided. Click here for NRS 116.31085.…limitations on power of executive board to meet in executive session; procedure governing hearings on alleged violations; requirements concerning minutes of certain meetings. Click here for SCA CC&Rs 7.4, Compliance and Enforcement on page 35. Click here for SCA bylaws 3.26, Enforcement Procedures on page 20. Click here for SCA bylaws 5.2, Deed Restriction Enforcement Committee on page 23. There are more laws to protect owners, but you get the idea. At SCA, the Board is supposed to serve as the appellate level when there is a charge that an owner has violated the governing documents. The Board is not supposed to initiate actions against owners directly. First, the issue is handled by the Covenants (aka Deed Restrictions Enforcement) Committee that formally provides the first steps of the due process guaranteed to owners to protect them from being unfairly sanctioned for an alleged failure to comply with the CC&Rs. If an owner is going to be sanctioned or fined for not following some rule after the Covenants Committee has investigated and heard the case, the owner can still appeal to the Board and can have an open hearing if requested. This system works great except when the Board of the GM decides to bypass it. 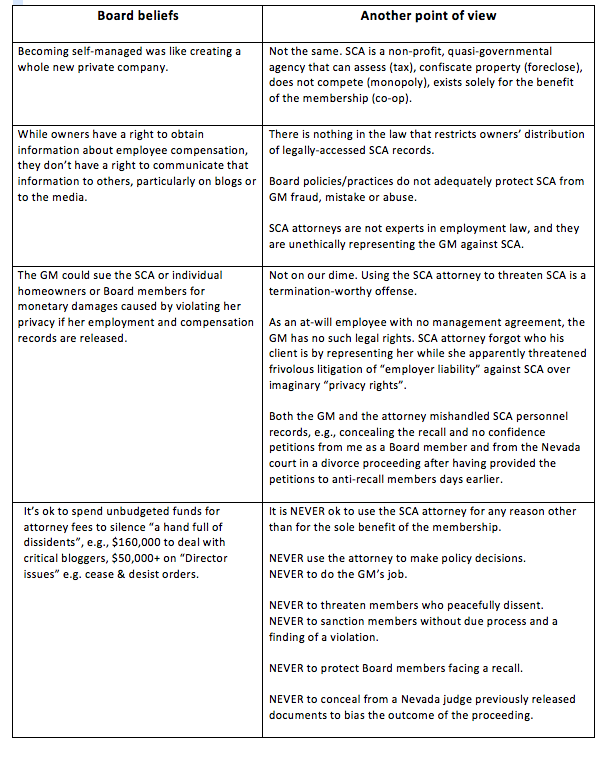 SCA governance must be the best fit to protect the owners’ interests, and under self-management, it is not. SCA CC&Rs and bylaws are not optional. The Board can’t legally cherry-pick which rules to enforce or make up rules that apply only to certain people. Yet, “on the advice of counsel”, it does. If the Board claims that taking away an owner’s rights was justified because it was done “on the advice of counsel”, it is wrong. A wrong opinion by the association attorney does not excuse the Board of culpability. It just shows that the Board used owners’ money to pay a hired gun to mow an owner down. Rex Weddle’s chronic use of Board work groups is ill advised. It guarantees that the Board will not be as well-informed as it could be prior to making decisions affecting all SCA owners’ pocketbooks and lives. It actually builds conflicts of interest into the system because it differentiates between individual directors access to information and authority. It does not use the best expertise that is freely available. It gives inappropriate power to the President to silence and punish political opponents. It sets does not permit the Board to be fully informed before making decisions. This causes unnecessary liability and risk to SCA and excessive cost to owners because appropriate executive controls are deficient or absent. A committee structure is needed (NOT Board work groups) that utilizes resident expertise to prevent fraud, mistake and errors by management. 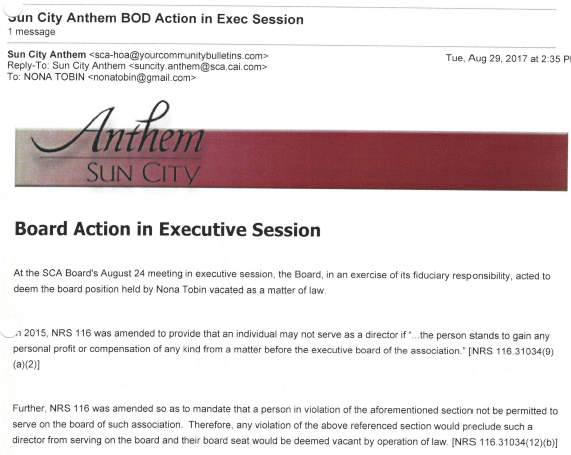 Why didn’t SCA Board charter owner committees when self-managed Sun City Summerlin offers a successful model? Apparently because the majority of the board thinks they know what’s best for owners without involving them. Rex Weddle thinks that as President he is the “decider” of who is “authorized” to work on a problem by appointing “Board work groups” and that directors with a different perspective can be excluded just on his say so. Owners must speak for themselves. I stand for owners’ rights. That’s what got me kicked off the Board. Not the load of crap they are shoveling about me making a profit.